An opera is sure of success when the plot is well worked out, the words written solely for the music and not shoved in here and there to suit some miserable rhyme … The best thing of all is when a good composer, who understands the stage and is talented enough to make sound suggestions, meets an able poet, that true phoenix; in that case, no fears need be entertained as to the applause – even of the ignorant. That’s the term one of Philip Glass’s collaborators, Shalom Goldman, famously applied to the idea of transforming texts from ancient artifacts into the libretto for Akhnaten. Glass worked with Goldman and a handful of others to craft the libretto for this third in his trilogy of “portrait operas” including Einstein on the Beach and Satyagraha. I’m completely spellbound studying this work now ahead of the Los Angeles Opera production directed by Phelim McDermott and starring Anthony Roth Costanzo (which premiered to ecstatic reviews last spring at ENO). I came across a work by [Immanuel Velikovsky] that was new to m: “Oedipus and Akhnaten.” It is a concise and scholarly work in which Velikovsky attempts to trace the origin of the Oedipus legend to the period of Akhnaten, the 18th-Dynasty Egyptian pharaoh who, in modern times, is looked upon as the first monotheist. Like everything else about Akhnaten, though, this one-word description hides more than it reveals. A couple of months ago, Angelenos were treated to a concert by a chamber ensemble known as The Golden Bridge (whose singers include some members of the Los Angeles Master Chorale). Led by Suzi Digby, Lady Eatwell OBE, and true to its name, the ensemble links two golden ages of choral music: Tudor England and the remarkable choral creativity now flourishing in California — particularly in the Los Angeles region. 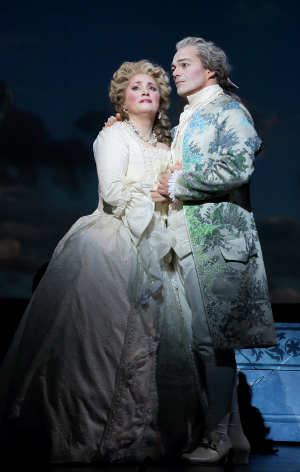 One of the most thrilling evenings I’ve experienced in years at the opera house — at the theater in general — was last weekend’s opening night of Los Angeles Opera’s new production of The Ghosts of Versailles. It’s comic and serious, entertaining and erudite, silly and thoughtful, emotional and mysterious, harrowing and uplifting, intimate and over-the-top — and the more times you see it, the more you’ll find in it and the more you’ll get out of it. It helps to be an opera or history buff to get all of the references, reminiscences and send-ups, but it’s not necessary. A better performance of this large and complex work couldn’t possibly be hoped for and I can’t express strongly enough what a tremendous experience it was to see live. We were “in the presence of the composer’ last night as they say. In an achingly beautiful LA Opera production, the ghosts of monarchies and revolutions past materialize before our eyes at the Dorothy Chandler Pavilion. We are enveloped in an exquisite postmodern version of Marie Antoinette’s little theatre at Versailles, awash in dusty blues and pearlescent greens. It is the world of John Corigliano’s opera, The Ghosts of Versailles. With an expensive stage set that rivals the royal opera house in Versailles and a large cast that includes a headless Marie Antoinette and a rabid army of French Revolutionaries — as well as an exotic temptress portrayed by a certain Broadway star who enters astride a hot-pink elephant — L.A. Opera’s production of The Ghosts of Versailles at the Chandler Pavilion is a visually stunning affair. Patricia Racette gives a commanding performance as Marie Antoinette, combining wistfully naïve nostalgia with nightmarish horror. In the end, there wasn’t even enough room on stage! At the curtain call the cast stretched the entire width of it with several getting squeezed out of the final bow. Corigliano’s opera really is larger than life, and, appropriately, the last person brought out was the composer himself. The Ghosts of Versailles, over 20 years after its première, (which was 11 years after it was commissioned) was worth the wait. While the opera isn’t perfect, it is a colossal achievement. William M. Hoffman’s poetic libretto with Corigliano’s evocative fusion of styles makes not only an impressive spectacle of theater, but an opera of intense feeling and LA Opera’s production captures that magic exquisitely. It was a triumph. This Saturday brings the opening of Los Angeles Opera’s new production of The Ghosts of Versailles by John Corigliano and William Hoffman. There’s an entire category of landmark operas that originally met with resistance from their own composers. Take Ariadne auf Naxos. In its first version, the work posed so many problems that a frustrated Richard Strauss shelved the project for several years. And when he was approached by director Peter Sellars with the concept for his first opera—a venture tentatively titled Nixon in China—John Adams initially kept a skeptical distance. The inception of The Ghosts of Versailles couldn’t have offered a more encouraging set of circumstances. Desiring to present a brand-new work to celebrate its upcoming centenary season, the Metropolitan Opera was determined to pull out all the stops. What composer would not leap at the chance—especially given such a spectacular context for his debut opera?